Offers: Twilight offers and club 'loyalty' discounts. See website for details. Bar & Catering. Professional shop. Teaching professional. Equipment hire. Good practice area with 22 bay driving range and short game area. North Weald Golf Club is one of the most improved golf clubs in Essex, North Weald Golf Club was originally designed by Peter Allis and Clive Clark and redesigned by David Williams in 1994. This par 71 course at 6377 yards, was chosen as the venue for the Youth Shield Final, the Essex Matchplay Trophy (The Allan Lockwood Trophy) and has also been chosen to host the Essex Amateur Championship in 2008. It has a demanding layout, with water coming into play on 3 holes, and offers a challenge to all levels of golfer. Facilities within the large modern club house are generous and include purpose built changing rooms and shower facilities, two bars and a function suite catering for up to 100 people. A comprehensive menu offering bar snacks and large meals is available in the bars where friendly staff provide a warm welcome and efficient service. Overall not the most interesting designed course. Greens were not in the best condition. . . often with bare patches and worm casts. Friendly enough staff . . poor for a members course. 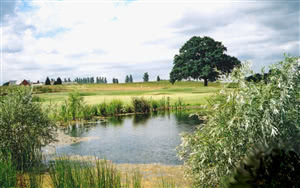 If are new to the area spend your green fee on Hainault instead. Good Layout, Shame About The Greens !! I really like the layout of North Weald GC, wide fairways, challenging par 3's, severe rough, if you stray offline but, the majority of the greens were awful. Very uneven roll and many holes which were shown up by blue marker paint around them; they were also very bobbly. Once they get these sorted out, then this will be a good course to play for £20. I don't think that North Weald will likely be most player's favourite course, but that doesn't mean it should be dismissed totally. The greens, tees, and fairways all looked like they were suffering in this rain-free summer, but they all played okay. Most of the holes are fairly open with little rough, so play the tricky holes well and you can get a decent score. The tricky holes would probably be the 4th and 10th, if my memory serves me correctly, both of which would be stand out contenders for the nicest holes on the course too. There isn't a pro shop as such, just a reception area that happens to sell balls, gloves, and tee times. The girl working there was very pleasant and welcoming though. There's nothing really wrong with this municipal course but there's not a great deal to recommend it either. The greens have been hollow tined but are still playable. It's quite hard to distinguish the fairway from the rough but that's partly because the rough is very short. My benchmark for public courses is Trent Park which is a much nicer course than North Weald, but you get about 6 hours to appreciate how nice it is on a Saturday round while waiting for the two-ball in front of you to work out which end of the buggy is the front. I recommend the bacon roll.